Back in 2010, Matt began a journey. 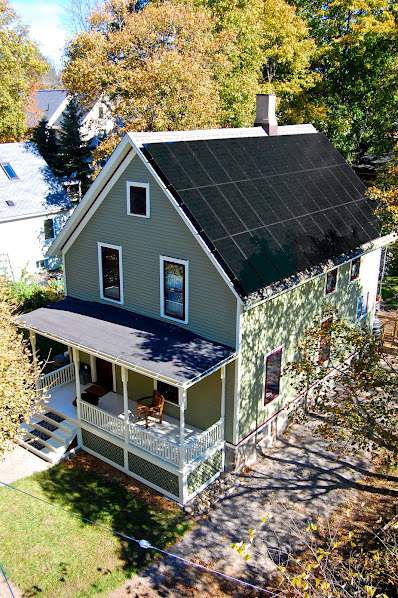 He purchased a 110 year old home in Ann Arbor, MI that has led him on the international road promoting net-positive homes and buildings. 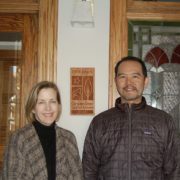 When he bought the home, he reviewed the LEED for Homes program but decided against it. He found it to be too invasive for what he wanted and could afford to do to his existing home. 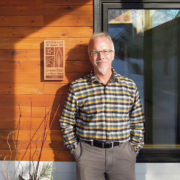 Matt, in partnership with Meadowlark, was a pioneer in the world of Green Home deep energy retrofits in the Midwest and has helped influence what can and should be done to bring an existing home to net zero energy. 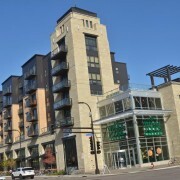 Despite lacking a good tool (like LEED or GreenStar), Matt and his family persisted on with the renovation. First they underwent a home energy assessment utilizing the HERS index. The results were off the charts – far above 100. “From there we needed to work backwards. Using the PV watts calculator, we determined we could get roughly 9,000 kwh of solar given size of our roof and available technology. For 9,000 kwh to be sufficient, we realized we needed to improve the home’s HVAC, insulation, air sealing, appliances, lighting and other areas to get us down to that level without sacrificing comfort or a normal lifestyle,” Matt explained. 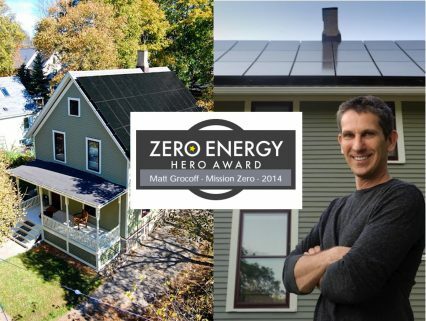 Through the detailed but simple measures listed below, Matt’s home is a proven Net Zero home – even while driving a Chevy Volt and charging it at home! 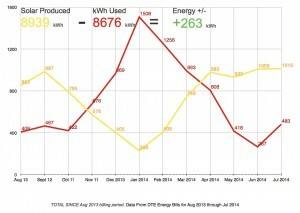 They plan to add a little more PV so that they can update their vehicle to a Tesla and still remain net zero. One thing that I learned while sitting down with Matt and discussing the push back to an all-electric home is the claim that it’s a waste because of electric line loss of up to 10% energy. Most utilities and even the HERS score incentivize the use of Natural Gas. Matt enlightened me to a partnership between Google and the Natural Resource Defense Council that is utilizing Google vehicles to show major natural gas leaks in gas lines all over the country. 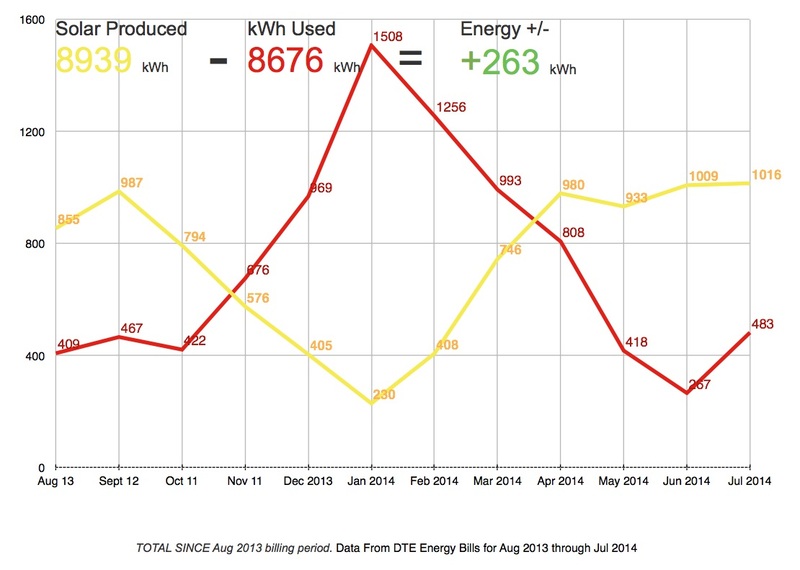 These leaks are not accounted for in line loss of energy, while electric is. 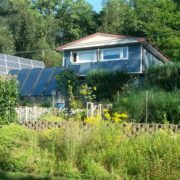 Beyond energy, Matt and his family were inspired by the Living Building Challenge (which they are pursuing) and are now, in partnership with U of M Blue Lab Engineering and a Ford Foundation Grant, exploring Net Zero water. The goal is to be able to design a system that captures 100% of rainwater off the roof, stores the water, and cleans it to potable and non-potable standards. 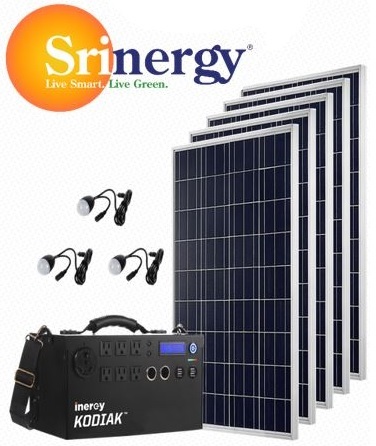 The final step would be attaining approval by the municipality to install the system. One interesting challenge the Grocoffs must overcome is that their asphalt shingle roof has been proven to contaminate runoff water toxins such as lead. These toxins are very expensive to remove. However, the cost to seal the existing shingles or replace the shingles may prove cheaper in the long run than maintaining a clogged water filtration system. Another element that Matt and his family are working on is to prevent 100% of the home’s storm water from getting into the city sewer. This could be done partly by capturing water from the roof, partly by adding rain gardens. The most unique idea is a partnership with the city that would replace the sidewalks in front of the house with a system that will direct rainwater from the sidewalk to his rain gardens. If it works, replacing sidewalks this way could model in Ann Arbor and in other cities around the country how to reduce the expense and pollution caused by run off and storm water. 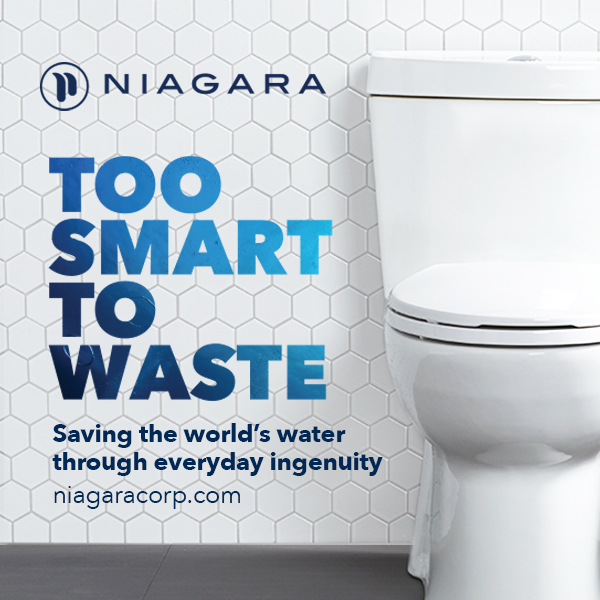 Even though we live near the Great Lakes and have access to more water than we need, it’s no secret that quality and quantity of water is diminishing. “While all the news media was going on about California this year, much of Michigan was experiencing a major drought and lack of underwater aquifers. It’s important that we have deeper conversations about water in our state and how to protect it through simple things we can to do our buildings,” says Matt. 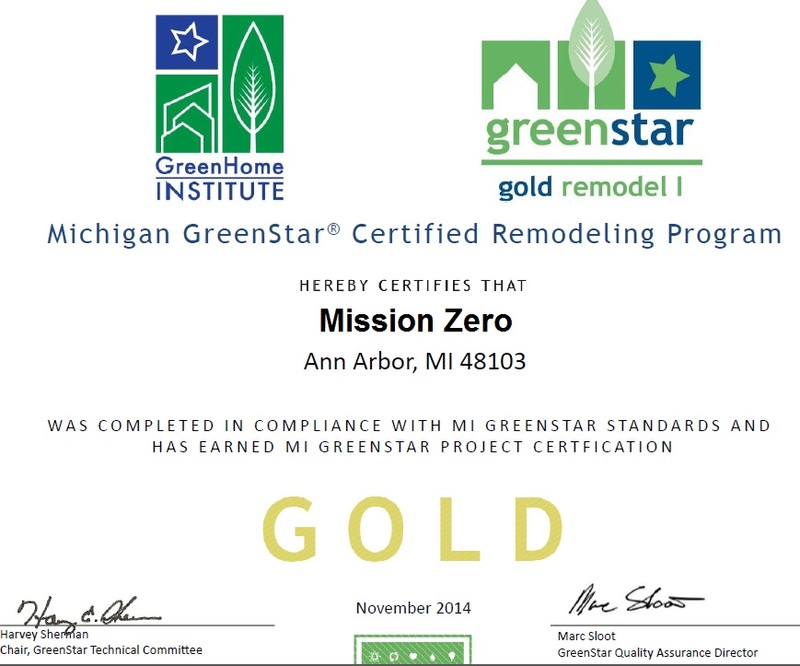 Because of Matt’s diligence during the renovation process, his home was easily back certified to GreenStar standards. He blew the gold standard “out of the water.” explained Brett Little. We also are grateful to work with him to develop recommendations for existing homeowners using the GreenStar tool to achieve our new zero energy certification. 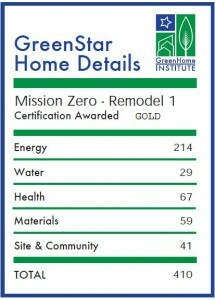 We are very excited to award Matt and the Mission Zero Home with the GreenStar Gold Type 1 Remodel Certification and to induct him before anyone else into our Zero Hero Hall of Fame. 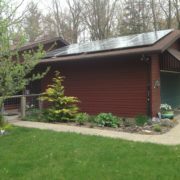 We will be monitoring Matt’s house and following his case study as he supplies us with Return on Investment, future energy use, water use, indoor air quality testing data, and other interesting aspects as he continues to do more to his home. Free Webinar worth 1 hour of continuing education – GBCI, AIA (HSW), NARI Green & LFA and review utility data. More here. Living Space: 1300 sq. ft.
Greenstar checklist submittal with full details on the home. Retained Existing home through minor remodel! Perimeter plantings kept up to 24 inches away from the home. 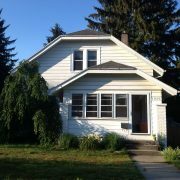 Milwork, countertops, cabinets, trim, floors, and windows all refurbished and reused. 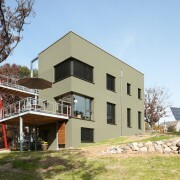 *Some of this list was borrowed from Matt’s house being featured on Green Building Advisor.